Crescent Shield is an American melodic heavy/power metal band which began in 2000, originally as a side project for then-Onward vocalist Michael Grant and then-Destiny's End guitarist Daniel Delucie. The two creative forces were heavily involved in their respective projects but managed to record several demos during the three years between CS's inception and its materialization as an actual band in the summer of 2003. The original demos featured Michael Grant on vocals, Dan Delucie on backing vocals, all guitars, bass guitar, and drum machine. When Onward finally disbanded in the summer of 2003, Grant and Delucie decided to convert their project into a full band. They completed the line-up with drummer Craig Anderson (ex-Ignite/Engine) and bassist Melanie Sisneros (ex-New Eden/The Iron Maidens/Sinergy), two veterans of the Los Angeles music scene. Together, this foursome strives to bring forth energy-driven traditional/power metal to the United States. 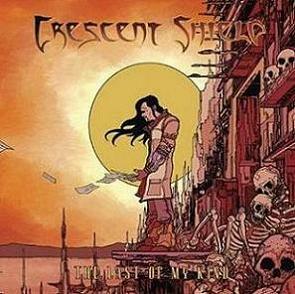 Crescent Shield brings forth high-energy guitar riffing/solos combined with melodic vocals and a solid metal backbone.